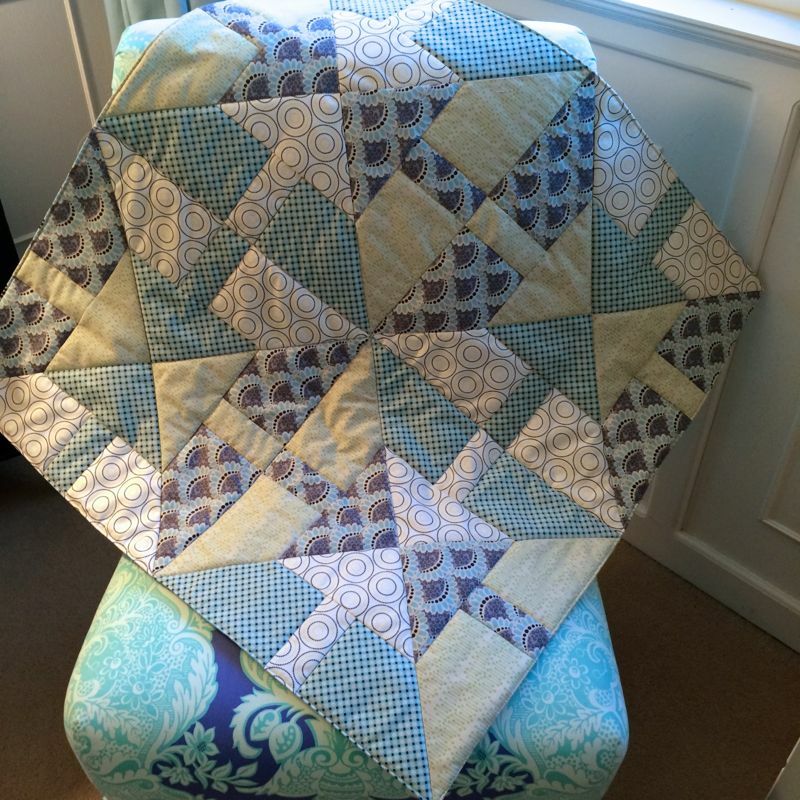 Neonatal/Preemie Quilts with a Free Pattern | OccasionalPiece--Quilt! Posted on March 29, 2015 by Elizabeth E.
The Riverside Raincross Quilt Guild, to which I belong, has many community service projects, one of which is their making and donating neonatal, or preemie, quilts to the County hospital’s NICU. I sat across from Mary last guild meeting, as she patted the stack of little quilts, and told us the story about how her friend, who is a nurse, lays them all around the layettes when she gets a new stack from us, and how she loves looking at them. All those little quilts made with love. They are 30″ square, lightly quilted (at least all the ones in the stack were, for that makes them more huggable and drapable). I had some fabric I’d ordered last year that I wasn’t that fond of (the hazards of online-ordering, although the fabric itself was very popular and cute and I thought it would be good for a boy), plus I had a block I wanted to try out, which first surfaced in the 1940s. Here is a PDF pattern for that block, a 15″ square Twin Darts: Twin Dart 15%22 block. (Click on the link to download.) Make sure your printer settings are set to 100% and it should come out okay. You’ll be making four large blocks. It’s an easy pattern, but there are a lot of bias edges, so my advice (in hindsight) would be to give them a good shot of spray starch before piecing. All the quilts are pre-washed before they go to the babies, so it will be washed out. But I ended up going the tutorial from Rita, of Red Pepper Quilts (found *here*), as it was not for an art quilt (which Susan’s is) and yes, I did baste the quilt top to the batting in a couple of places before sandwiching them all together, then turning. I then top-stitched around all the outside edges to close up the opening, then quilted around all the arrows (or darts) and other main seams. Done! I have another one in the works, which I’ll post about, too, as well as give you the free pattern. I put this up on Instagram, and many people had the same response I did–a good way to winnow down the stash as well as doing good. While looking through the web for guidelines about batting (apparently polyester or cotton, no wool), I found this document and modified it to post here: neonatal_quilt_guide Please check with your local guild as to size and other requirements, as they are obtained from your local hospitals. Thanks so much, Elizabeth!!! This pattern is awesome and I know of a couple of quilt groups that will put it to good use!!!!!! Hugs………………. I am stashing this pattern away for my own destash (as we discussed on the ole IG). So happy you posted it! 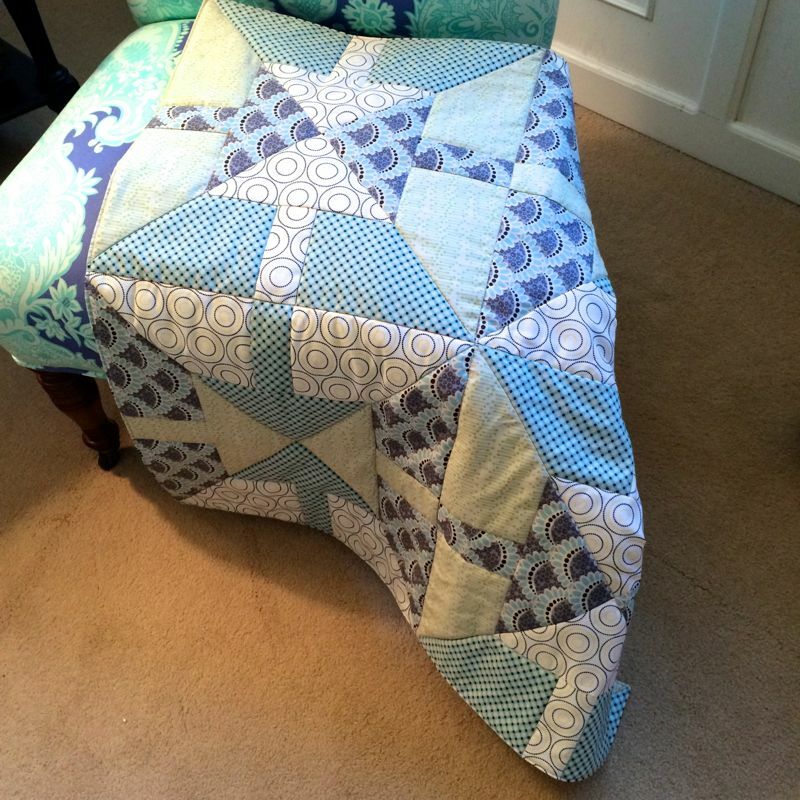 That is a great pattern and the blue quilt turned out so cute. Thank you for sharing it with us. This is such a sweet pattern! I love the softness of the blues… And donating makes it even more special! Such a sweet little quilt for a worthy cause. Thanks for the link to the guidelines. I want to look into it more. Our guild will be making lap quilts for seniors this year. babies was last year.